Restaurant Franš is located at No 18a Bulevar Oslobođenja Street and it's an ideal place for daily and evening entertainment. Restaurant Franš offers amazing gourmand cuisine and wide selection of drinks only for your pleasure. Staff of restaurant Franš, beside Serbian is very fluent in English and Italian, so it's a perfect choice if you are planing business meeting with international partners, or if you want to organize private party or gathering. Interesting thing about restaurant Franš is that it has always been a place for girls night out so they can feel very comfortable. Atmosphere in restaurant Franš is very pleasant and here you have a feeling that you are always welcome. Sense of elegance and perfumes and relaxation is something that makes this place unique in Belgrade. This is a place were you will always want to come back, partly because of legendary waiters. A feeling of always being welcome and the fact that there will always be a table for you, makes this place unique. In restaurant Franš you will always have unforgettable time in presence of your loved ones. Do not miss to enjoy in perfect taste. The offer is fantastic: 45 types of salads and small gourmand burger are menu for ladies, while for gentlemen restaurant has prepared breaded paprika with cheese, gnocchi and best wines along with hot buns and homemade deserts. 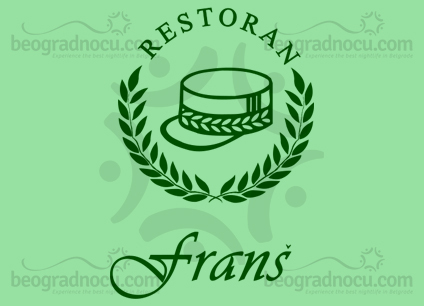 Restaurant Franš is symbol of Belgrade, first class place for society, place to show of new wardrobe, new loves, closing business and family time.